I’m not in the habit of hosting a bunch of giveaways – though I get lots of offers. However, sometimes something comes along that I think would be really great for my readers. This is another one of those times! Mattress Giant wants to help relieve a little stress this holiday season by giving away a “dream” package, including an Embody by Sealy Motivation Queen set, sheets, pillows and more (valued at almost $3,000), to help you get a great night’s sleep! To complement their “What Do You Dream About? 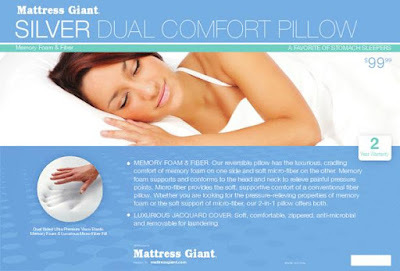 Sweepstakes,” they’ve given me one of their Silver Dual Comfort Pillows (valued at $99.99! Who knew?!) for me to sleep on and review and I’m going to give one to one lucky reader by November 28th! There are few things I value more than my sleep so I have to admit, I was a little reluctant to try a new pillow. However, I’m happy to say that this pillow is a winner. I’ve been sleeping on this pillow now for a week and it’s been very comfortable. I’m a weird sleeper. I sleep on my side with my arm under my pillow (or maybe that’s normal?) and it’s not always comfortable. My big ole melon head makes my arm fall asleep. Interestingly enough, I didn’t have that experience with this pillow. I’m not 100% sure why but I think it may have something to do with the supportive memory foam. So let me tell you a little about the pillow you’re getting a chance to win! It’s got a reversible design. One side is made of memory foam to relieve painful pressure points (which is great if you’ve got a big ole melon head like me), and the other side is made of plush micro-fibers for added comfort. It’s really soft but not soft in a way that doesn’t give you support. Comment letting me know you’d like to be entered to win and which of the above you chose.